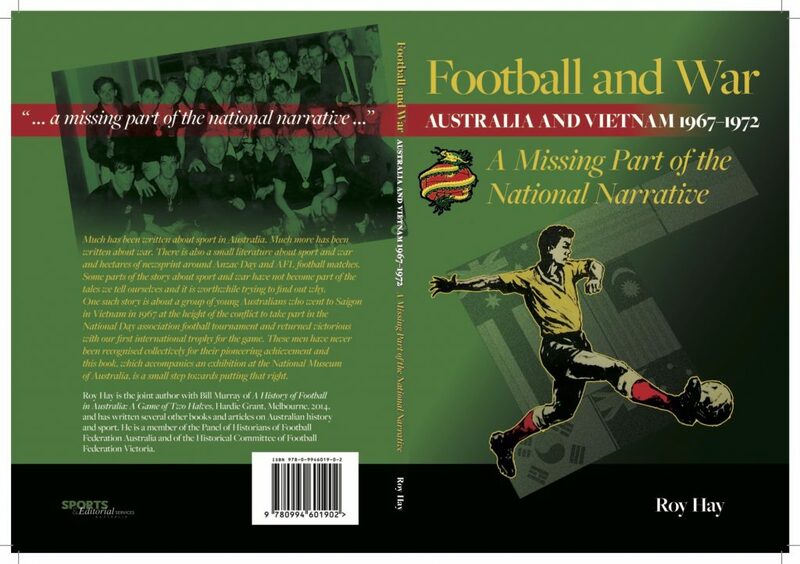 Book Review: Football and War: Australia and Vietnam 1967-72. A missing part of the national narrative. Throughout their boom-bust history the Socceroos have been pioneers in many different ways. They were the first team to play Advance Australia Fair long before any other national team mumbled their way through it. There was also the ‘spew top’ playing strip that has never been matched for ugly national team sportswear (which is saying something in Australia). Then there was the inclusion of new Australians in to the national side when the White Australia Policy was at its peak as well as a curse being placed on the team by a witchdoctor in Mozambique. What is missed in all of this flotsam and jetsam through the years of Australian sport is that the Socceroos also played in Saigon in 1967 as part of a poorly thought out propaganda exercise to improve the moral of Australian troops and win the hearts and minds of the locals. This tour was then followed by more tours in 1970 and 1972. The Australian Soccer Federation (ASF) was a poorly organised and poorly funded basketcase around this time but for once this wasn’t their fault. After their 1965 humiliation by North Korea in Cambodia during their first bid to get in a World Cup the side, like many other national sides, had sporadic matches that cost them money with sport in Australia still very much state based rather than a national collective. The rather poorly named ‘Friendly Nations Tournament’ was dreamed up by the South Vietnamese to try and drum up support for their cause. The idea was allegedly first floated during a tour to Australia by the South Vietnamese leader early in 1967 with the Socceroos, New Zealand, Singapore Malaysia and big wigs South Korea to head to Saigon. The ASF agreed to do the tour to better prepare themselves for the next World Cup after they drowned in their own ignorance some two years previous against the well drilled North Koreans. The Australian Government somehow also allowed the dangerous tour to go ahead citing the sport as the one that could bridge the gap between the football loving locals and Australian forces. The Government was unbelievably sending a national sporting team in a war zone to raise morale in what was a dangerous and opportunistic PR exercise. The fact that the criticism aimed towards the Holt Government about the War was starting to rise was also a factor in the decision. 18 players, 9 staff and 1 AAP Reporter would make the perilous journey. The Socceroos did well in the tournament but the competition was dysfunctional at best. The squad was picked just a couple of weeks out from the tournament meaning leave had to be begged for by the players seeing as they had day jobs. Once in Vietnam, one player was almost killed by a live wire in a hotel light switch that him flying across the room while also around the same time two Viet Cong were caught trying to smuggle a bomb in to the hotel to attack the South Koreans; some said it would improve ‘The Golden Building’. Then there was the training pitch which was a local park with sticks put up to make the goals and a 7 foot fence at one end of the park. It was only when the players were climbing said fence to try and get some balls that had been kicked over on to another field that the locals told them in a panic the fence was there because said field was full of mines. For the actual games the players played in front of massive crowds for the first ever time. Along with a game against Malaysia ending in a cloud of tear gas they were involved in one of the more stereotype soccer pastimes of a riot when they beat the hosts 1-0 through then captain Johnny Warren that upset many of the local betting syndicates. After somehow getting back in to the change rooms thanks to the local military intervening they did a lap of the field carrying to the South Vietnamese flag as some kind of olive branch with the sound of mortar attacks nearby. The American and Aussie soldiers got involved in adopting the team with some of the latter taking eskies full of beers to the games like it was a test match at the SCG in January. Even some Viet Cong were said to be in support of Australia at the games seeing them as struggling under the continued tyranny of Great Britain. Of all the players in this squad coached by ‘Uncle’ Joe Vlasits many would go on to play in the 1974 World Cup and see this tour as what galvanised the side for future endeavours. This side achieved so much in those seven or so years with FIFA not knowing where to put them in qualifying for the World Cup and the ASF so tight with money they were going to ask for the players’ tracksuits back at the end of the tournament in Vietnam (they eventually reversed their decision). An amazing part of history for not just the Socceroos but Australian sport in general yet as we come up to 50 years since the tournament why isn’t it more widely known? Why isn’t this bit of sporting bravery through bureaucratic stupidity not commemorated by the wider Australian public? This question is especially prevalent with the constant attempts to connect sporting endeavors to the Anzac spirit, mateship and going to war; this team actually went to a war. Football historian and author Roy Hay ponders this in his new book ‘Football and War: A missing part of the national narrative’. A fantastic read that goes deeper in to the reasoning behind the tour, the events of the tour (and others that followed) and questioning its importance and place in Australian sporting history. Well worth a read and another fantastically researched piece of work from Roy. This seems like an amazing book. I know nothing about soccer so i had no idea of this tour. The conflict in Vietnam was a challenging period in our history,with one getting an impression aspects of this time are being ‘rewritten’, for political reasons. I have an interest in this period,so i should go out and grab myself a copy of this publication. Is it readily available ? Cost?